So what exactly is Graphic Design? Today, Graphic Design is an integral part of our day to day backdrop. From TV advertisements to Newspaper print, and Roadside Billboards to walking billboards on the front of shirts. Designers work hard to capture to eye of nearly every demographic and the many, many markets around the globe. Print Process and Garment type you require dictates the level of detail, design quality elements, and feasibility of printing on different types of garments. Color Schemes of your design will help classify your organization, team or brand. Logos, mascots, artwork, stars, megaphones, animals, etc. Size and Placement are the biggest limiters of the design. For obvious reasons, a smaller design will only allow for so much detail, before it because unrecognizable. A larger design can quickly overpower the space and overwhelm the look. Budget will set the limits or bounds of all these factors. Are large print with more colors will be price a bit higher than the alternative. We take into account all the criteria and seek out to create a PERFECT design. We have lots of tools at our disposal, but everything starts with powerful image and vector editing software. Adobe Photoshop (PS), allows us to take your raster images to print. With PS, we format the photo, correct the color balances, and add text elements among other things.Most of our designs are created in Adobe Illustrator (AI). With AI, we can insert stock vector images, clip art, or traced raster images and combine them with designer text to form the concept. In some cases, it may be necessary to send your artwork to an outside contractor for vectoring or redraws. This typically incurs a very reasonable cost ($25). This process takes a raster or otherwise non-vector image and converts it to a vector graphic. We can convert hard paper goods, hand drawings, and even printed shirts. 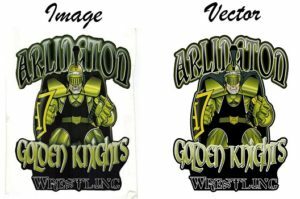 For example, in the Arlington Golden Knights logo, we scanned the sticker on the left and she redrew and added the vector content for print. Our contract designer is very good and understands the process very well. Once your design is ready, we will create and submit an electronic design mock-up to you for comments, concerns, and approval. You can view, add any design changes, and approve the design online. We will not start the production process until you are 100% satisfied with the design. All printing includes up to 30 minutes of free design. Thereafter, we charge $30 per half hour. With that said, we have only had to charge this fee one time. 99.9% of all designs are done within this time-frame. 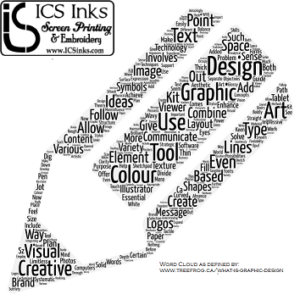 With a little insight, experience,and expertise, ICS Inks can create a design you’ll love to make the statement your most interested in. After all, Nothing says it better than a T-shirt!